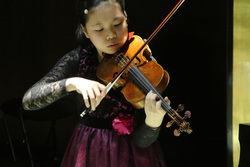 Wong Kwun Yee (Dora) began playing violin at the age of four. She studied with Ingrid Ho Hung Ying before transitioning to the tutelage of Nanette Chen in 2015. Dora has won numerous prizes in the Asia region including competitions in Hong Kong, China and Taiwan. She won the second prize in the Open Class of the Hong Kong Strings Scholarship for Stringed Instruments in the the 68th Hong Kong Schools Music Festival. She won the first prize in the Violin Section Professional Category of the Third Japan-Hong Kong International Music Competition, the second prize in the Aficionado Junior Violin Division, the Award of Excellence in the Youth Violin Division of the second Alice and Eleonore Schoenfeld International String Competition for Violin and Cello, and the first prize in the Junior Category of the Eleventh Violin Competition of Academy of Taiwan Strings. Dora was invited to perform with Hong Kong Children's Symphony Orchestra in the Tuen Mun Music Festival in 2009, Symphonic Cordiality Hong Kong in 2014 and Academy of Taiwan String in the National Concert Hall in 2015. Being a music lover, Dora is a choir member of the school choir and plays piano, viola and clarinet for leisure.